A tea is a tea is a tea is a soup? 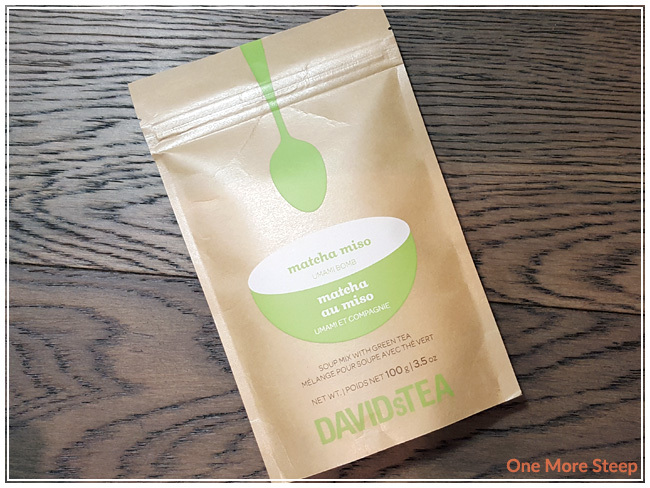 DavidsTea recently released Matcha Miso, which is their latest tea soup mix offering. Described as being an “umami bomb”, I was curious enough to try it out even though you have to buy it in prepacked 100g pouches. The pouch itself has a kraft paper outside with a silver foil lining, with a see-through bottom so you can see the green powder of the soup mix. The aroma of this tea soup mix reminds me a lot of miso soup, which I love having when I’m out for sushi so I do have high hopes for this. 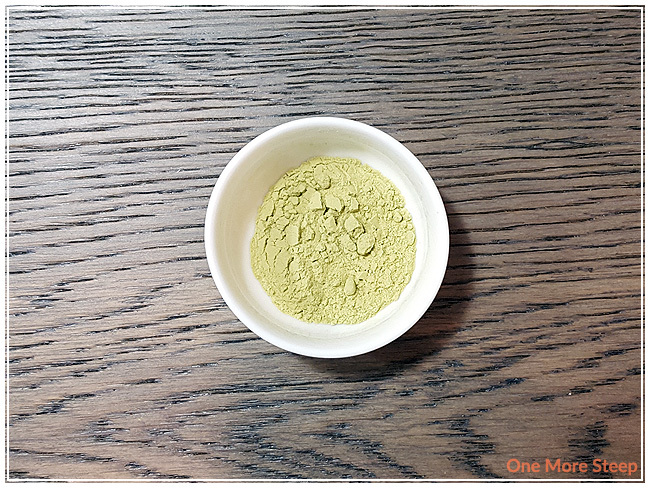 Matcha Miso consists of: matcha green tea, white miso powder, seaweed extract. For those with allergens, it does contain soy (in the miso powder). 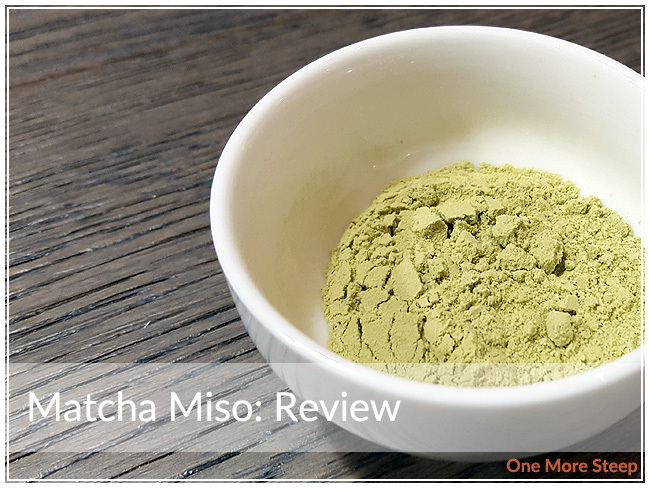 The aroma of the powder is mostly that of the miso with a hint of vegetal goodness from the matcha itself. DavidsTea recommends using 1-2 spoonfuls of Matcha Miso and mixing it with hot water, which is described as “near boiling” on their product page, which is 90-95°C (194-203°F). 1 cup is said to have 390mg of salt, which is 16% of your daily recommended intake. I opted to use a small spoonful of the Matcha Miso powder. Matcha Miso stirs up to be a very greeny-yellow looking colour, it’s not as bright as you would expect a matcha to be which is fair considering that’s not the only ingredient. If you’re familiar to miso soup, you know if you let it sit it starts to separate, which is the same thing that happens here so you do have to stir it to keep the powder suspended throughout. The aroma reminds me a lot of miso soup, and has a nice vegetal fragrance to it. 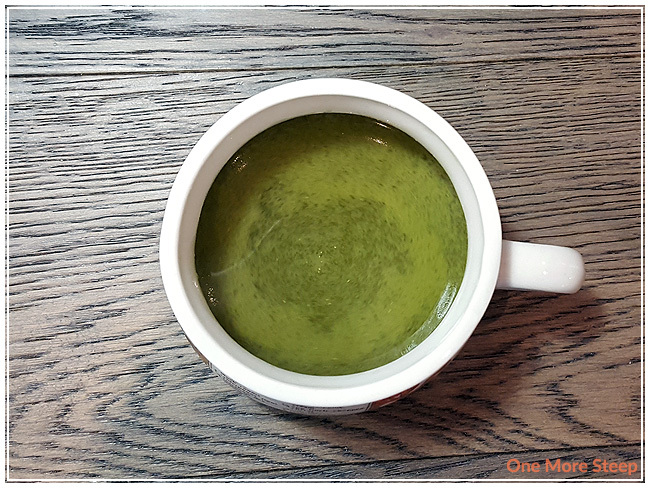 The taste of Matcha Miso is very much a flavour bomb. I would say the miso is on the forefront, while the matcha plays understudy very well in terms of the balance of flavours. It’s tasty, and I really enjoyed it. I did use less powder and more water to dilute it a fair bit though, and still found it to be quite flavourful. I think using two spoonfuls of the powder would be incredibly salty – but to each their own! Because Matcha Miso is a powder that gets mixed up and then drunk, there are no second steepings! I loved DavidsTea’s Matcha Miso. I was pleasantly surprised by this tea soup mix, I think it’s incredibly flavourful. I think it would be a great soup base for ramen (think noodles, cubed up tofu, bean sprouts, maybe an egg on top) or for some miso soup at home (adding some cubed tofu, seaweed on top) to go on the side of your rolled-at-home sushi. I could see this tea soup mix being versatile in how you could change it up every time to get a different type of soup. The matcha adds such a nice vegetal flavour that it sort of adds an extra level of flavour experience.